Our Fall Shred Day is quickly approaching! 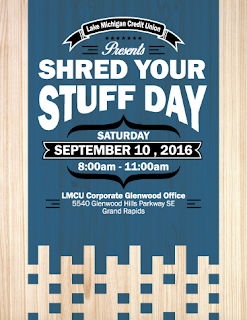 Join us at our Corporate office located at 5540 Glenwood Hills Parkway SE in Grand Rapids, where West Michigan Document Shredding will be on-site from 8 A.M. until 11 A.M. to securely shred your sensitive papers and documents. Mark your calendars!